This state-by-state map pairs pollution and public health statistics, revealing what is at stake if the Affordable Care Act and environmental regulations are repealed. The Center for American Progress created a map that shows what is at stake for public health should congressional Republicans and the administration succeed with these rollbacks. The map demonstrates how many adults and children have asthma and how many residents rely on the Affordable Care Act, or ACA, for access to health insurance in each state. These are residents whose health would acutely suffer should Congress gut regulations and repeal the ACA. The map also provides state-by-state data on how much pollution is pumped into the water and air each year; these pollution levels could increase if the attack on America’s environmental and public health protections succeeds. A review of the map shows that some states have more to lose from simultaneous attacks on environmental health protections and access to insurance coverage. These are states in which residents experience both a relatively high prevalence of asthma and a high level of reliance on the ACA for health coverage, making them most at risk for the concurrent repeal of the ACA and environmental protections. (see Table 1) Several of the most at-risk states suffer from high pollution levels from the power sector. Others have been or are becoming home to booming oil or gas production, which is responsible for significant emissions of methane and other air pollutants. 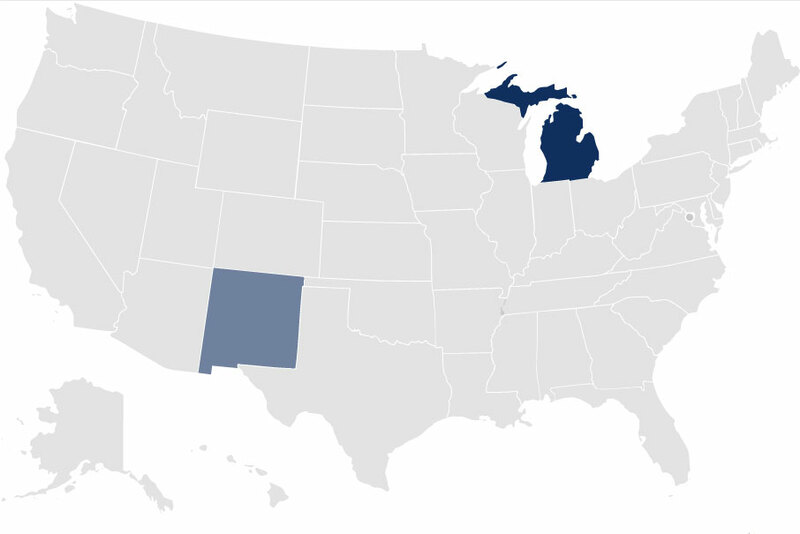 Ohio, Pennsylvania, Michigan, Kentucky, West Virginia, and New Mexico have high rates of asthma, as well as high reliance on the ACA for health insurance. Additionally, with the exception of New Mexico, these states all have high power-sector pollution levels. New Mexico, Ohio, Pennsylvania, and West Virginia, for their part, are all major producers of oil and gas. 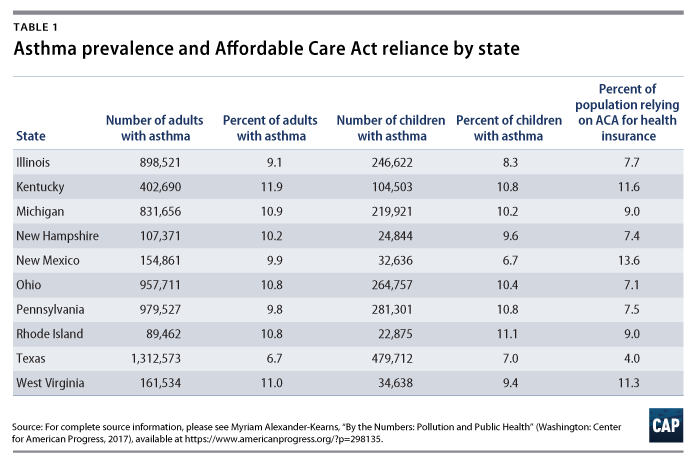 Illinois also has above-average rates of asthma and ACA coverage and high power-sector pollution. 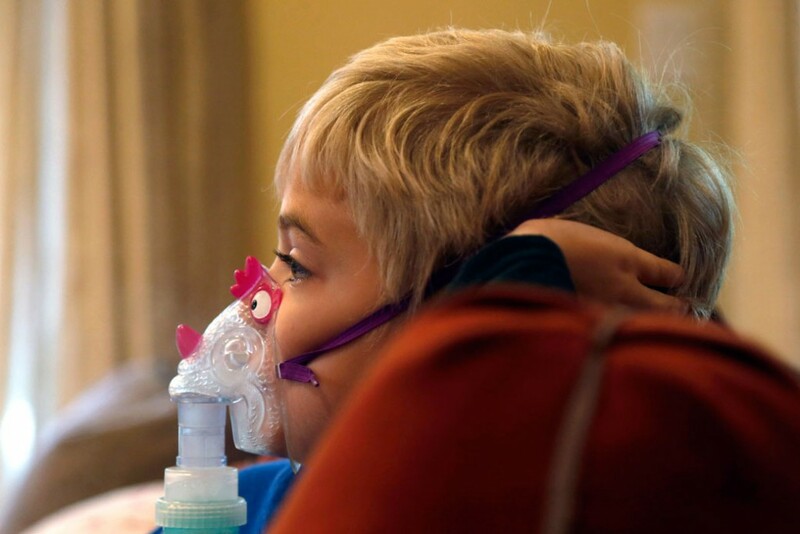 Texas, on the other hand, has relatively low rates of asthma and ACA reliance, but a significant portion of the state’s large population—1.8 million adults and children—suffers from asthma. Texas is also a massive oil and gas producer and has very high pollution from the power sector. The people of this populous state have a lot to lose if Congress and the Trump administration weaken the federal environmental standards for electric utilities and oil and gas drillers. Not all of these most at-risk states are heavy polluters themselves. New Hampshire and Rhode Island have relatively low levels of power sector emissions but are affected by pollution from out of state—a reminder that a weaker standard in an adjacent state can compromise any state’s efforts to mitigate harmful emissions, often at the cost of public health. In an effort to alleviate this kind of pollution, the Clean Air Act includes the so-called good neighbor provision, which requires states to reduce upwind pollutant emissions. In 2011, the Environmental Protection Agency, or EPA, finalized a rule that enforces this provision. This rule, however, could be rolled back should Scott Pruitt become the next EPA administrator. As Oklahoma attorney general, Scott Pruitt opposed the EPA’s good neighbor rule. State leadership on higher vehicle emissions standards could also be undermined if Pruitt is confirmed to lead the EPA. Rhode Island, for example, has adopted California’s vehicle emissions standard, but Pruitt has indicated he might support eliminating states’ rights to adopt and enforce California’s more stringent standard. If Rhode Island loses its ability to adopt the higher California standard, more polluting cars would travel on Rhode Island roads. Since the 1960s, Congress has relied on regulatory measures to promote public health and protect communities from environmental hazards, including air and water pollution. Through these regulations, power plants have reduced emissions that cause acid rain—avoiding numerous premature deaths—and Americans breathe less pollution every day, resulting in fewer cases of bronchitis and asthma and fewer missed work and school days. A 2011 peer-reviewed EPA study found that from 1990 to 2020, the Clean Air Act’s air quality and health benefits will outweigh costs 30 to 1. The link between environmental hazards and public health is clear: According to the American Lung Association, ozone—a major component of smog and a result of tailpipe emissions—increases risk for asthma. Other pollutants that seep into drinking water, such as mercury and lead, also have detrimental effects on health. Polls show strong bipartisan support for clean air protections to reduce these health risks, particularly for children and other vulnerable populations. EPA Administrator nominee Pruitt, however, has indicated that he would scale back regulations on these pollutants. In addition, greenhouse gases—such as carbon dioxide released from burning coal and methane that leaks from oil and gas systems—exacerbate climate change, which poses a serious threat to human health. Scientists have concluded that 2016 broke the record for the highest global temperatures—marking the third year in a row that annual temperatures set a new bar. Severe public health impacts accompany the extreme weather events of climate change, and the increased temperatures and pollutants in the air can exacerbate allergies and increase asthma rates. As droughts become more frequent, dust and particulate matter increase, further reducing air quality. The EPA has long been entrusted with regulating these threats to the environment; however, the Trump administration—which now includes former Exxon Mobil Corp. CEO Rex Tillerson as secretary of state—has committed to reducing regulation across the board. While public health coverage and environmental protections are natural companions, both the ACA and a large set of the EPA’s rules are under attack. Congressional Republicans have already begun efforts to dismantle the ACA with actions in the House and the Senate. Leading health policy experts agree that even more people than those who are insured under the ACA would actually lose their coverage under a repeal due to the subsequent fallout in the market. To make matters worse, congressional Republicans have begun to apply the little-used Congressional Review Act to vacate significant environmental rules made in the final months of President Barack Obama’s administration. With a simple majority vote from both the House and Senate, Congress can overturn critical environmental regulations—such as the Bureau of Land Management’s restrictions on methane emissions from oil and gas operations on public lands—and prevent an agency from ever making a similar rule again. Congress also is likely to consider legislation to weaken air quality standards, nullify clean water protections, and make it easier for polluters to block new pollution limits. Furthermore, in the “America First Energy Plan” released on his first day in office, President Donald Trump proclaimed that he will use executive action to repeal President Obama’s hallmark Climate Action Plan, undermining the Obama administration’s efforts to cut carbon pollution from the power sector and shift toward clean energy generation. As the attacks on the ACA begin, Americans need environmental regulations that protect the nation’s air, water, and public health more than ever. The map discussed above displays state-by-state information and shows what is at stake in each state if these regulations are to vanish. The numbers resonate loud and clear: Environmental regulations and the ACA advance public health. Myriam Alexander-Kearns is a Policy Analyst for the Energy Policy team at the Center for American Progress. The author would like to thank Alison Cassady for her contribution to this column.